Hello! I'm back with another Viva La Verve card. I used Amber's Viva La Verve sketch, VLVNov03. 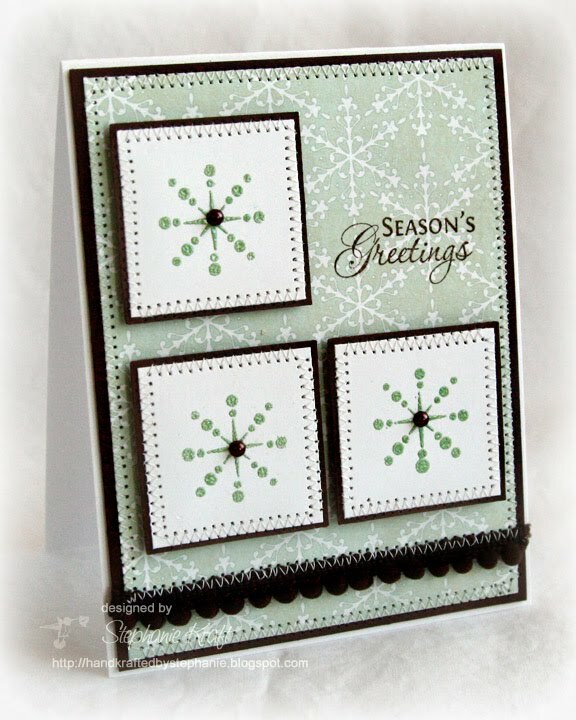 The "twist" was to create a fall/winter holiday card. I stamped the largest snowflake from Snowflake Splendor three times in Versamark and heat embossed with some sage embossing powder. Accessories: Square punch (Marvy), Embossing powder, Chocolate pearls (Kaisercraft), Ball trim (Wright's), Foam tape, Thread, Sewing machine. This is so pretty. I love this color combo.